The IVAM’s library specialises in modern art and serves the purpose of providing all IVAM activities with documentary support as well as contributing to the spreading of modern art by putting at the disposal of scholars and researchers both its facilities and its collection. It is a free access service. The Collection contains about 50.400 documents, placed into two spaces, the store and the Reading Room, with 26 seats available for users. Monday, Tuesday, Wednesday, and Friday: from 10:00 a.m. to 3:00 p.m.
Tuesday: from 10:00 a.m. to 7:00 p.m.
Vacational holidays (Christmas, Fallas, Easter, Summer…). To consult any of the funds located in the deposit, you must request at least one day in advance, the copies required through the email account bilbioteca@ivam.es or directly in the room. From October 15th, 2015, the Library has a new exhibition hall, which has been enabled to host educational activities and display bibliographic and documentary based on the funds of the library and archives of artists deposited in the museum exhibitions. – Tuesday to Sunday: 10:00 a.m. to 7:00 p.m.
– Friday: 10:00 a.m. to 9:00 p.m.
From here you can access the catalog of the Library of IVAM for querying the titles. You can also check the rules of use and access to the Library and the type of funds that can provide users both books and journals, monographs, videos, audio recordings, posters and manuscripts. The Library of IVAM offers users a number of services, among which includes the consultation room of over 12,000 volumes, access to the internet from the computers of the reading room or the possibility of taking home the documents available for loan, with the requirement to have your Library card. 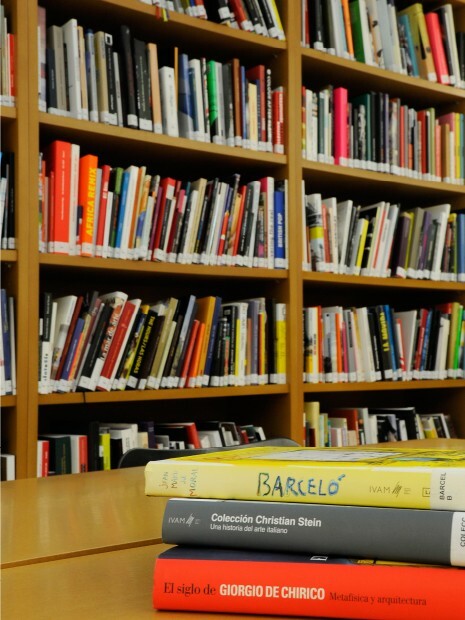 The Library is open for the purpose of study and research in modern and contemporary art. It contains approximately 12,000 open access items. Multimedia material is also accessible. Means of reproduction are offered to users. Rare books and archives are accessible after demand. Online access to computerized catalog of the Library. The IT Facilities are made available for you to use principally for the purpose of your research or studies. You are allowed to make occasional personal use of the IT Facilities only if such use does not disrupt or interfere with normal operation of the Library, or disturb staff or other Library visitors. The Library is Wi-Fi hotspot allowing customers’ free Internet access via a Wi-Fi enabled laptop or PDA. Borrowing from the Library is restricted to registered members of the Library. Details of borrowing rules and forms are available on internet. Materials in stock may be reserved and retrieved in advance. Staff will inform the reader when the items are available via email or telephone. The reader should make use of them within two days. Libraries requesting the loan or a copy of holdings belonging to IVAM Library may write to biblioteca@ivam.es. We provide a scanner self-service facility for the users to get copies of documents of the Library. Copyright law must be observed when copying of Library material and in all copying carried out in the Library, whether by reprographic or any other means. The copy of rare or fragile contents is under the discretion of the staff. Scanners and cameras may only be taken into the Library with the authorisation of the librarians, pursuant to the limits of the Intellectual Property Law. The Library will generally allow reproductions of materials in its collections for research use. When reproduction was for other purposes, users should ask to the Library for permission biblioteca@ivam.es. Instructions for ordering and information on fees will be provided. It is up to the user to obtain the permission for copywrited works. The Bibliographic Information Service responds to all types of enquiries, both from its in-house and remote users biblioteca@ivam.es. Staff guides users to learn the resources the IVAM Library has available, so that they can take full advantage of them.